The Ohaus Dial-O-Gram Balance (1650-00) is well-equipped to handle the job whether it's weighing solids, liquids, powders or even animals. 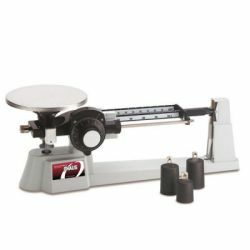 The Dial-O-Gram balance provides the convenience of a top loading balance with the durability and versatility to accommodate a range of lab applications. All models have a tare beam to allow containers up to 225g to be balanced out. The Dial-O-Gram balance combines the versatility of even arm balance and the speed and convenience of dial reading up to 100g.